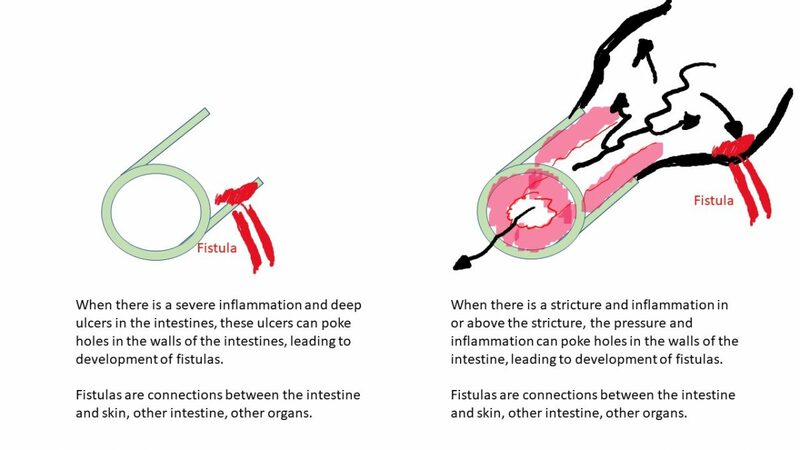 Chronic uncontrolled inflammation of the digestive tract can lead to symptoms, poor quality of life, malnutrition, and many complications, such as fistulas, strictures, loss of nutrients, and even cancer. There are many medications and your doctor will choose the one that work for you. The risks and benefits of taking medications and controlling disease need to be carefully considered. Each medication has potential side effects, but great benefits. Speak to your gastroenterologist about your options for treatment. 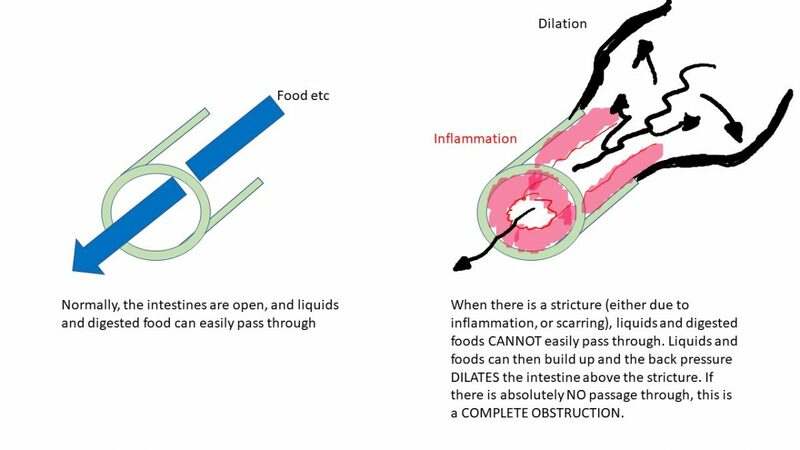 IBD are chronic diseases, and most people with IBD require maintenance (long term) medication to keep them in remission. 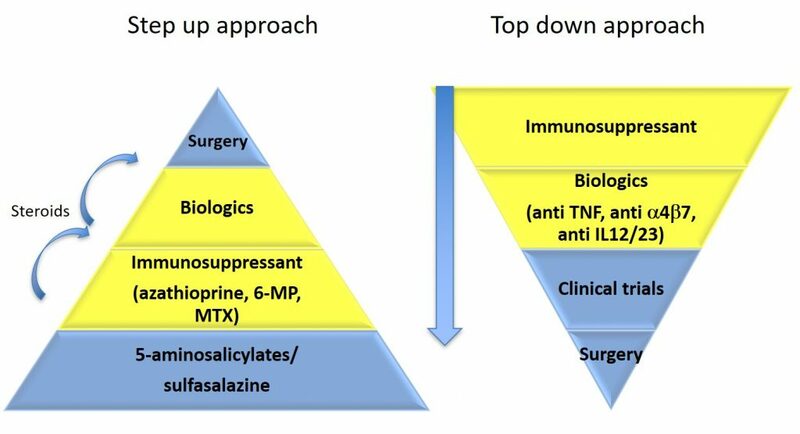 The two main treatment approaches are the “STEP up” strategy and the “TOP down” strategy. In the STEP up treatment strategy, clinicians will prescribe milder drugs that have less side effects, and increase doses or add stronger medications or more targeted medications when patients flare, and when patients require repeated courses of steroids. When medications no longer work, or when there are complications of the IBD, surgery may be advised. Clinical trials are considered the “next, next” line therapy once existing and approved therapies fail. In the TOP down approach, clinicians will often start with stronger drugs that will control the disease faster or with more success, often starting with targeted therapies (e.g. biologics) or immunosuppressants, and in some cases with clinical trials or surgery. 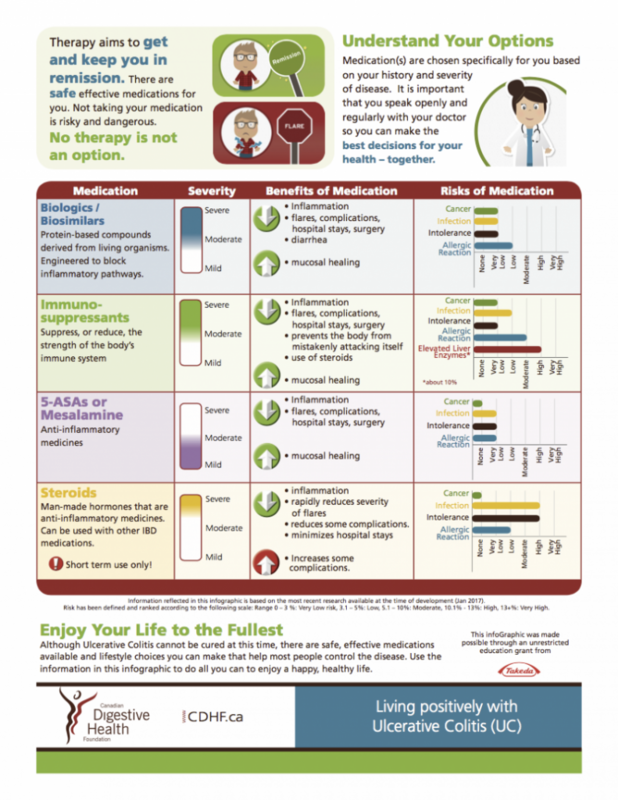 IBD medications can be induction (to get you better quickly) or maintenance (long term medication to keep you well). Please note that steroids are not meant to be maintenance medications due to the many many side effects associated with taking steroids long term. What about IBD medications and Pregnancy? Most IBD medications can be continued during pregnancy, however Methotrexate should be stopped before and during pregnancy. Click here for more information about IBD medications and pregnancy.